Backup is made without stopping the server (the use of the VSS service ensures consistency and recoverability of snapshots). To restore data, the plug-in firstly stops Exchange Store Service and all dependent services, then copies the files, and then re-launches them. The plug-in supports all versions of Microsoft Exchange Server 2003, 2007, 2010, 2013 and 2016. It is important that your version of Handy Backup match your operating system, i.e. for 64-bit version of Windows Server, you need to use 64-bit version of the program. 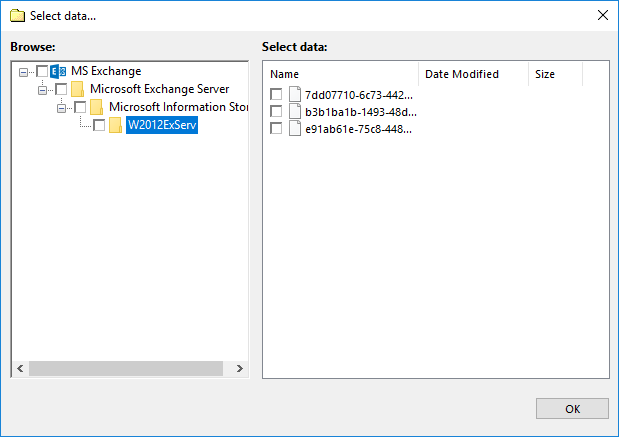 To use the MS Exchange plug-in, Workstation must be launched from a user account that can make API calls to the Exchange VSS Store Writer and Volume Shadow Copy Service services. Folders correspond to Exchange Servers and carry the respective names. They have no attributes. Files correspond to Stores (databases) available on the respective Exchange Server. File names correspond to internal identifiers of the databases. They have no attributes. Since the plug-in provides no attributes for files and folders, it cannot be used with incremental backup option. When files of the MS Exchange file system are compared to files already backed up, they are always considered as new, which means that each increment is effectively a full backup. To optimize the usage of disk space, use differential type of backup. During backup, the software creates files that are named similarly to identifiers of databases. Each file is basically an archive that contains all data files and logs of the respective database. 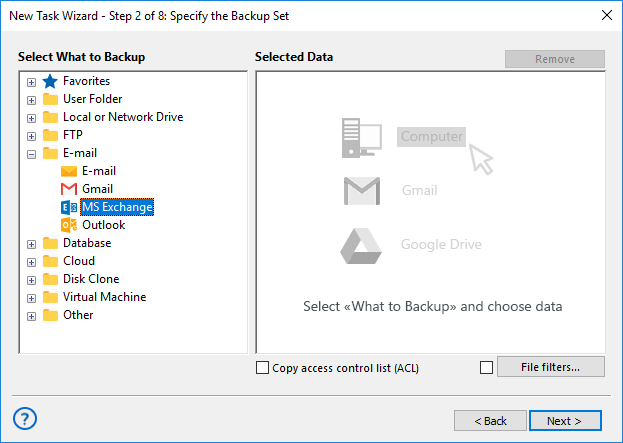 The MS Exchange plug-in can only be as a source of data for backup tasks. See Specify Backup Set for more details. In the Data Sources pane, select MS Exchange in the Email group. The Select data... dialog will open. Check the boxes next to databases (files of the MS Exchange plug-in) that you want to back up. Browse for the index file (backup.hbi) located in the destination folder. Select it and click Next. Skip the Select Restore Locations dialog by clicking Next (as there is no way to restore data to a different location). Skip the next steps by clicking Next. When you run the restoration, the plug-in firstly stops the Exchange Store Service and all Windows services that depend on it. Then it copies the files to their original locations, and re-launches the services.